The Mastercard Sector Insights DataFeed contains United States sales volume and transaction counts for 28 sectors with at least nine years of history available on a weekly, monthly, and quarterly basis as of January 2019. Mastercard’s Sector Insights DataFeed reveals shifts in United States consumer spending patterns by analyzing, indexing, and tracking the change in sales values, transaction growth and average ticket for large, national retailers. With a proprietary classification system based on NAICS, Sector Insights provides a weekly micro-sector performance indicator for comparison against leading merchants in a specific sector or subsector. Mastercard payments data are only available via Sector Insights and Spending Pulse. The Mastercard Sector Insights DataFeed contains sales volume and transaction counts for 28 sectors with at least nine years of history available on a weekly, monthly, and quarterly basis as of January 2019. In addition, Mastercard provides eCommerce sales breakouts for seven of these sectors. 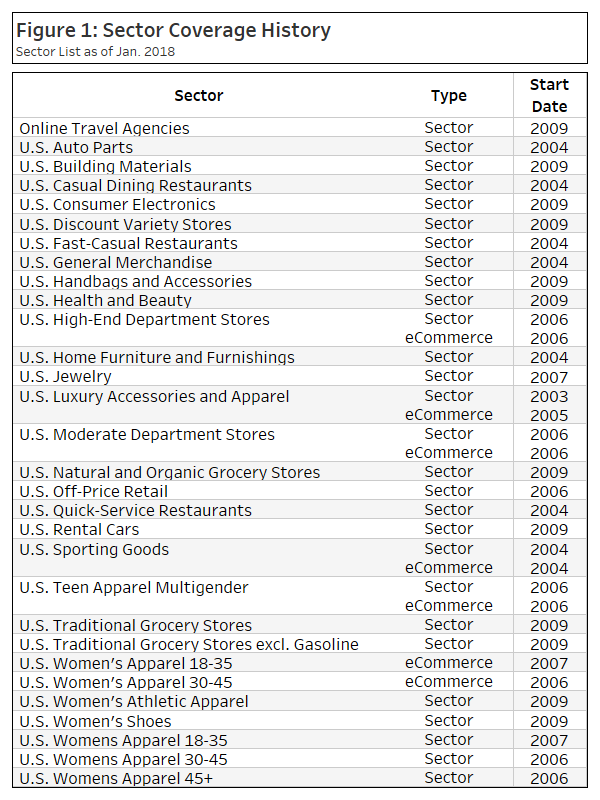 Figure 1 shows the historical availability for all sectors and those with an eCommerce component have been highlighted. Sector Insights is built upon a proprietary methodology that spans three key pillars: the sources of transactions, point of sale location, and sector classification. A combination of aggregate and anonymous sales activity from the Mastercard payments network, estimates for other forms of payment (i.e. cash or check), and supplemental data from third-party sources are used to create indexed sales values and transaction counts. To calculate aggregate transactions by merchant, the country of the transaction must be identified. Mastercard relies on the point of sale for each transaction. For multi-geography merchants, transactions are associated with point of sale country and not aggregated to a headquarter or primary location for the merchant. This methodology ensures that Sector Insights will only include transactions that occurred within the U.S. For select sectors, Mastercard will also determine whether the sale was done online or in-person. The final step, is to identify the top 5-10 companies within each sector to calculate a sector level data point. Companies are selected based on their country of domicile. Mastercard then uses a custom classification that is like the North American Industry Classification System (NAICS) but in some cases provides a more precise taxonomy. For example, Sector Insights’ “U.S. Rental Cars” is comparable to the NAICS “Passenger Car Rental and Leasing” sector. On the other hand, Mastercard provides incredibly granular trends in spend with the sector for “Women’s Apparel 18-35.” Using this classification in combination with transactions and point of sale information, Mastercard produces sector level sales volume and year-over-year figures for sales volume, average ticket price, and total transactions for the nation’s top retailers. One interesting application is to examine trends related to online sales. With Sears filing for bankruptcy and the struggles of Macy’s and JCPenney, the death of the department store has been a popular prediction. How have companies tried to evolve? On one end of the spectrum you have Nordstrom’s, which has focused on improving its digital business and saw a strong uptick in online sales in 2018. On the other side is TJX Companies Inc, which attributes its sales growth in 2018 to the experience of bargain shopping at brick-and-mortar locations. Sector Insights can provide weekly data points into these trends by tracking sales and eCommerce volume within the High-End and Moderate Department Store sectors. Figure 2 shows an interesting trend over the past two years. High-end Department Stores sales volumes and online sales have grown year-over-year except for the second quarter of 2017. Moderate Department Stores experience has been just the opposite for total sales. Only the third quarter of 2018 has seen year-over-year growth. In stark contrast, the eCommerce breakout has posted double digit growth in seven out of the eight quarters. Overlaying this information alongside company KPIs such as online vs in-person sales or same store sales, would be a natural companion to this data set. 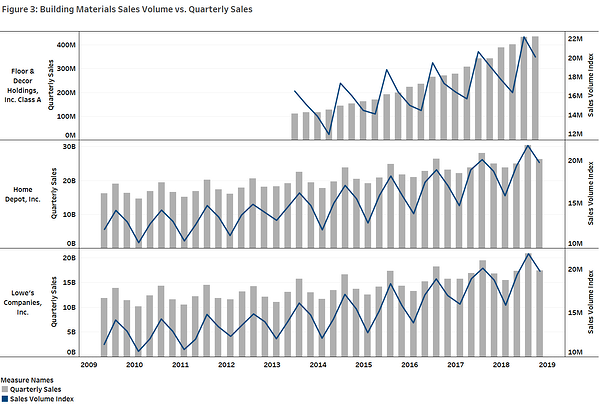 Another potential application of this data would be to determine if there is a relationship between companies’ quarterly sales and sector(s) Sales Volume. It is important to note that Mastercard does not imply that trends for any one or more merchant can be deduced from Sector Insights. With that said, let’s explore the Building Products Sector. This generally corresponds with NAICS sectors Home Centers and Other Building Materials Dealers. For this analysis, FactSet’s RBICS with Revenue was used to identify companies with a sub-industry of Home Centers and Hardware Stores. Three companies met this criteria, Home Depot, Lowe’s, and Floor & Décor Holdings. Lowe’s and Floor & Décor each source 100% of their revenue from Home Centers and Hardware Stores, while Home Depot is not far behind with 93.3%. 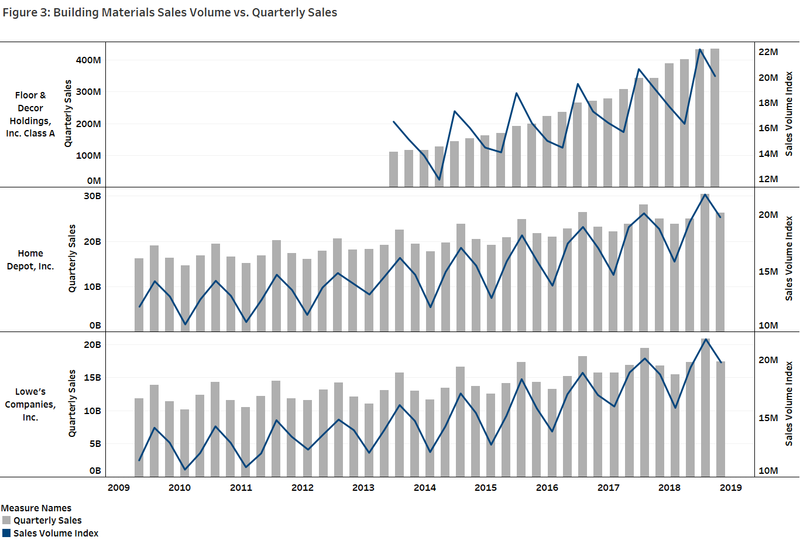 Figure 3 compares quarterly sales to the Sector Insights U.S. Building Materials Sales Volume quarterly figures. Figure 4 provides the correlation between the two values. It is interesting to see the smaller market value company, Floor & Décor, has a weaker correlation than the larger players in the sub-industry. These two examples showcase how this data can be used to provide insights into industry trends and identify companies’ relationships with a given sector. Mastercard’s Sector Insights DataFeed gives users the ability to track consumer spending patterns in the United States at a granular sector level. If you have questions or would like to learn more about any of the content mentioned above, please contact us at OFSupport@factset.com. Please visit the Mastercard Sector Insights product page on the Open:FactSet Marketplace for more information.